Even the most well-loved homes benefit from professional renovations. Kitchen and bathroom remodels increase quality of life and home values. While you’re sure to be satisfied by the end results of these updates, living through the chaos that is caused by the project can be a challenge to homeowners. Home improvement contractors such as Serenity Concepts LLC offer demolition services that speed up timelines for renovation projects. We tear down old fixtures and dispose of debris so that home improvement specialists can build out new rooms quickly. For an orderly work site during your next home renovation, call Serenity Concepts LLC at (262) 295-2145 to schedule demolition services. Besides preserving your sanity during your home remodel, demolition experts keep your projects on schedule. Why have your building contractor wait around for your work site to be cleared of unwanted sinks, countertops, and cabinetry, when they can start right away on giving you the new room that you desire? Contracting companies that don’t have demolition expertise in-house take longer to complete projects, and they charge for extra labor needs and extended schedules. You can avoid holding up your renovation effort by contacting us about our demolition services. Call (262) 295-2145 for a quick quote. Did You Know Wrecking Unwanted Building Fixtures & Structures Is Regulated? While your three-year old regularly demonstrates above-average demolition skills, tearing down a permanent structure requires professional expertise. 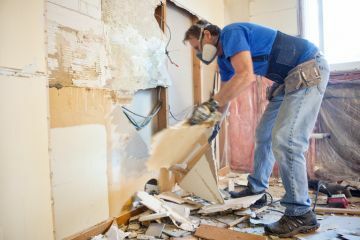 Some remodeling efforts involve handling dangerous materials or preserving natural land features, which is why many cities require that you get a permit for demolition work. Serenity Concepts LLC has been walking customers through the demolition permit and inspection processes since 2013. We make sure that your project starts and finishes smoothly. Sharp, broken tiles and splintered wood are common work site items during renovations. Without the proper training, tools, and gear, you could easily incur injuries by doing the job yourself. We’ve been performing safe demolition services for 6 years. Our technicians arrive at your home with the right safety equipment to execute your project according to our industry’s standards. Call us today at (262) 295-2145 to find out more about our demolition services.